Pack ‘N Plays are great for at home and away. A Pack ‘N Play may also be called a playard. They allow you to put your child in a safe place when you can’t place them in a crib, bassinet, or other playarea. Pack ‘N Plays have many functions. You can use them for a place to lay your baby down at Grandma’s house, you can put them in a Pack ‘N Play to entertain themselves in the living room as you dust, you can even use certain Pack ‘N Plays as changing stations. With so many functions and things you can do with these portable beauties, they have become a must have for every new parent. We are going to look at some of the top models out there today. There are a couple of types of playards to choice from on today’s market. You can find your everyday basic model all the way to your model that has everything but the kitchen sink. Choosing the right playard will depend on how you intend on using it. Your basic model of pack ‘n plays includes the enclosed space that your baby can play in to occupy their time or catch a little nap. Some of the basic playards will include a couple of features such as a changing table or a bassinet. The main features of the basic models are the fact that they are lightweight and portable making them ideal for parents on the go. Another great factor of the basic playard is that most of them are generally inexpensive. Your deluxe models of pack ‘n plays will have additional options and features to make life easier. Not only will some offer a bassinet or changing table, but some deluxe models have vibrating seats, storage areas, thicker mattresses, entertainment such as sounds, music, and lights, mobiles, and other great features. However, with the extras come a heavier product that cost more. Bassinet – Many playards come with a bassinet that is removable from the Pack ‘N Play. To remove it, you simply lift it from the Pack ‘N Play and you can use it in different places for your baby. The bassinet will sit on the top of the frame of the playard and makes it easy to pick it up. Be aware that most bassinets in Pack ‘N Plays are only good until the baby reaches about fifteen pounds. Then you simply remove the bassinet feature and use the playard by itself. Changing Table – A changing table is something else that many Pack ‘N Plays come with. They fasten securely to the frame of the playard and are removable when you don’t need it. This gives you a place to change your child without bending over on the floor if you don’t have a changing table at Grandma’s or changing on an unsafe surface such as a bed. Mesh Sides – To allow for maximum ventilation, playards have mesh sides. In addition, this allows you to be able to see your child from any angle. Storage – For added convenience, some playards come with removable cubbies or pockets. This makes it easy to store things you want close at hands such as diapers, wipes, toys, an extra set of clothes, and more. Portability – For those that are on the road frequently, Pack ‘N Plays are convenient because they are portable. All you have to do is fold them up and store them in the case that they come in. Most portable models are lightweight and compact enough to travel anywhere with while also being during and standing up to continued use. Entertainment – Pack ‘N Plays can also be entertaining for a fussy baby. Some Pack ‘N Plays come with entertainment such as toy bars or mobiles. There are even some playards that have options such as music, sounds, and lights. Canopy – To protect your baby from bright lights, sunlight, and offer some privacy, you may want to consider a canopy. Some children have a hard time taking a nap if they have disturbances from the outside world and a canopy will help talk those distractions away. Padding – The floor of the Pack ‘N Play is made of foam padding. This foam padding is where toddlers and older babies will play and sleep. Because they will spend all of their time on this padding, you want to make sure that the padding is adequate. Look for padding that is at least .75 inches thick. Style – Pack ‘N Plays come in every theme, pattern, and color that you can imagine. Whether your style is modern or traditional, or if you want a typical childlike look, you should be able to find a style that will fit any décor you are looking for. Clean-Up – Children can be messy. They may spit up or have an accident while in the playard. So only consider Pack ‘N Plays that can be cleaned easily. Look for detachable linings that can be machine washed. Twin Nappers – While this is not necessary for all new parents, but if you are blessed with twins, then you want a playard that has twin bassinets that are attached to the top. This will cut down on having to buy two playards as most twins like to be close to one another at this age anyway. Once they are too old for the bassinets, they can still use the playard. Wheels – If you will be using your Pack ‘N Play in the house and may need to move the playard from one room to another, then you may want to consider purchasing a playard that has wheels on it. It will definitely make your life easier. Folding Mechanism – Be sure that the folding mechanism on the playard that you purchase is easy to open and close and can withstand usage over a long period of time. JPMA Seal – The Juvenile Products Manufacturing Association independently tests baby products for quality and safety. If a baby product you purchase has the JPMA seal, you know that it was tested by them and passed their tests. We all live busy lives and can’t keep an eye on an active baby 24/7. A playard is a safe way to keep your baby occupied and safe if you follow the safety guidelines. A Pack ‘N Play is a safe place to keep your baby for a short period of time while you attend to other duties in the same area, while still keeping an eye on your baby. Playards are also a safe place to keep your baby at other people’s homes when they do not have a baby bed for you to place your baby. A Playard makes a good temporary substitute. When it comes time to go to Grandma’s house, the last thing on your mind is how in the world you are going to get your playard to her house. That is why it is so great that Pack ‘N Plays are so portable. They have folding mechanisms that make them easy to fold, and assembly is quick and simple. They come with a convenient carrying tote and some have wheels to make it easy to move from room to room. Babies require a lot of equipment. Pack ‘N Plays are great because some models fulfill several of those requirements at once. When traveling, of course, you have the playard, but in some models, you have the bassinet, changing table, storage areas, play areas, and more. And best of all, this all folds up into one unit for easy storage. Some of the more advanced models of the playards have entertainment centers on them that have features on them such as mobiles, toys, vibration, lights, music, and sounds. These activities can help promote auditory, tactile, and visual stimulation in children for enhanced brain development. All of this can make babies more attentive and help babies stimulate their growing senses. You always want to keep your baby safe. In a Pack ‘N Play is no different. Take these safety measures into consideration when using a playard or Pack ‘N Play. Check the frame of the Pack ‘N Play for durability and sturdiness. The playard should be sturdy enough to last for years. When it is set up, make sure it is steady in place. Always pay strict attention to the age restrictions and weight limits for the changing tables and bassinets and abide by them. Always pay attention to the playard and look for holes or loose threads in the mesh, lining, or fabric. If you find any, do not use it until it has been repaired if able. Make sure the safety label states that the playard is BPA, phthalates, and lead free as well as free from other chemicals. Do not use previously owned playards; especially from before 2013 as safety guidelines changed after this time. Do not place anything in the playard that the baby can tangle themselves up in. Do not add toys on cords as they can become strangulation hazards. 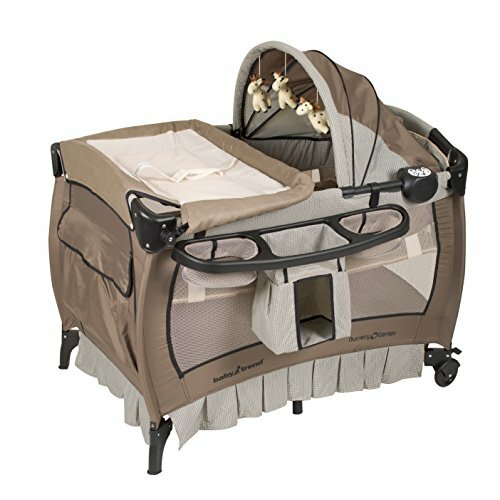 If you are looking for a Pack ‘N Play from a trusted name, then you may want to look at the Graco Pack ‘n Play on the Go Playard. This playard comes in eight great colors to fit in with any décor. For newborn babies up to fifteen pounds, there is a removable bassinet that folds away when not in use that is great for the baby to use to nap when at Grandma’s or even at home. The bassinet is easy to set up and fold down. For times when your baby needs a change, the changing station comes in handy. You can use it without or with the changing pad for a more comfortable changing experience. The changing table also has fabrics that wipe clean so you don’t have to worry about accidents. For ventilation purposes, all four sides are constructed of mesh. To make it easier to get the playard from room to room, this playard has wheels. To help entertain your child, there is a toy bar with three soft toys to offer visual interest. For ease of folding, this playard offers a push button fold for a quick and easy folding experience. The playard stores and travels in the included carrying bag. The playard is suitable for children for less than thirty-five inches tall. This playard is available in eight great colors. There is a toy bar to entertain the baby. A folding bassinet provides a place for a newborn a place to cat nap. The changing station is a great place to change a diaper in comfort. The Pack ‘N Play folds down compactly. The wheels do not have a locking mechanism. This product has a strong odor when you first get it – must air out. Overall, the Graco Pack ‘n Play on the Go Playard is a great Pack ‘N Play and of the quality that you would expect from Graco. The folding bassinet and changing station add value to just your basic playard. Add in the facts that it offers push-button fold and is compact and lightweight. It even has its own carrying case to carry all of its components. 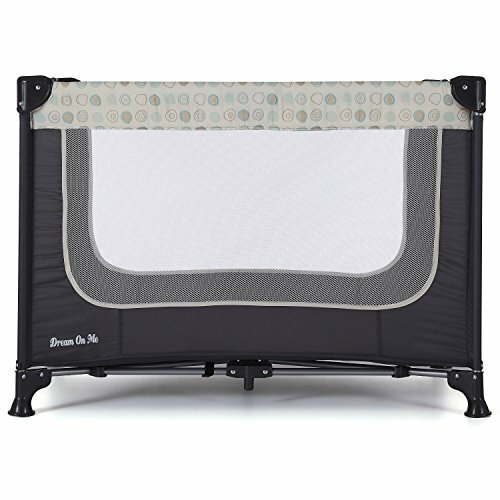 This nicely priced Pack ‘N Play comes in a wide array of color and styles for any décor. The main issues are the wheels do not have locking mechanisms on them which means they can slip on tile floors and this playard has to be aired out as it comes with a strong odor when it first comes. If you are looking for the playard that seems to have it all, then take a look at the Ingenuity Smart and Simple Playard. This playard comes with lots of different systems and areas for your baby. This playard has a DreamCentre for the baby that has soft cloth and mesh sides that allows ventilation and allows the baby to see out the sides. There is a canopy over the top that is removable that has two soft toys hanging from it for the baby to enjoy. There is a changing table that is at just the right height that makes changing diapers in any room a breeze. When you don’t need the changing table, it flips up out of the way. There is a convenient storage pocket area on the side of the playard to store all of your needs such as diapers, toys, wipes, and more. This keeps everything handy and neat. Even with the DreamCentre and Changing Table in place, you can have the bassinet set up. The bassinet has a thick mattress for a good nap. Once the baby is too old for the bassinet or is ready for the full playard, just a few buckles and the bassinet is removed and you use the same mattress as the bottom of the playard. All materials are removable with just a few buckles, snaps or Velcro and are machine washable. Wash the pieces that will get the most use and need washing the most – the mattress, DreamCentre, and changing pad. The sides of the playard are entirely mesh for visibility, airflow, and breathability. Folding up the playard is one step and fold with the bassinet still in place. It all stores in the included travel bag. The Ingenuity has a DreamCentre for babies to enjoy. The Changing Table is the right height and flips up. Most materials can be machine washed. There is storage on the side. The bassinet has a thick pad and runs the whole length of the playard. As the mattress pad folds, it can be a problem if you don’t lay it flat before using. The Ingenuity Smart and Simple Playard has a lot to offer as a Pack ‘N Play. The fact that it has a DreamCentre, a Diaper Center, storage, a bassinet, and can be washed on top of the basic playard are just bonuses. On top of that, it is easy to set up and easy to store. That makes this playard run to the top of my list of playards. The only problem I can see is that the mattress pad comes folded like an accordion. I suggest laying it flat for a few days before using it to get it used to be flat. Other than that, I don’t see any issues with this playard. If you are looking for a simple playard, then you may want to consider the Dream on Me Zodiak Portable Playard. This playard is simple in its design as it is just a playard without other entrapments. This full-size playard has mesh on all sides for visibility, breathability, and airflow. The Dream on Me is easy and quick to set up and take down to store in its own travel and storage case. The storage case has a convenient carrying handle. The playard has a frame that is made of lightweight aluminum and for mobility, it has locking casters. The fabric of the playard is a foam polyester that is both safe and soft. This playard comes in six colors to choose from and is at a great price point. This playard is intended for children under 36” tall. You can set up and fold this playard easily. 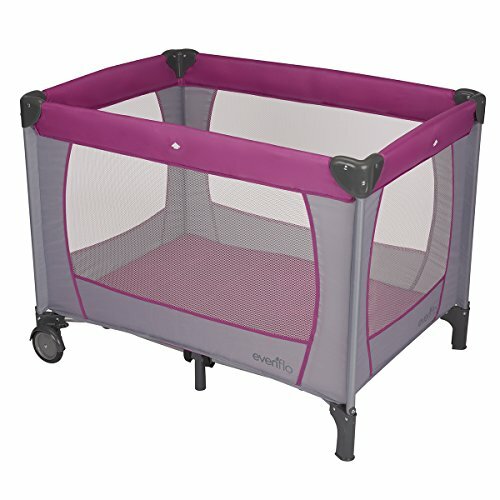 You can move this lightweight playard easily from room to room with the locking casters. The padding is very thin. Hard to get the latches to latch. No extras such as bassinet or changing station – very basic. The Dream on Me Zodiak Portable Playard is your bare bones, basic Pack ‘N Play. There is no bassinet or changing station to be found on this model. 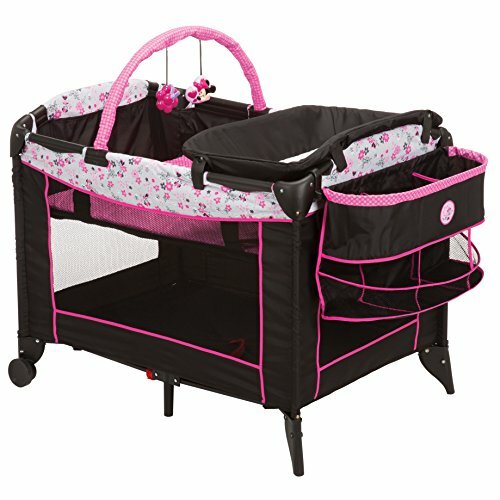 What you will find is a lightweight playard that is easy to move from room to room on locking casters. It is easy to set up and fold. And it has the standard all mesh sides. Unfortunately, this model has some setup issues and the pad seems to be very thin. While this model is very inexpensive, this just goes to prove that you get what you pay for. If you are looking for a playard that is larger, possibly for multiple children, then you may want to take a look at the Joovy New Room2 (Room Squared) Portable Playard. This playard has the play space of over ten square feet! That makes it almost fifty percent larger than most other playards. This playard has a low center of gravity which will support two babies in conjunction with the heavy duty mattress pad. This playard will support a child from birth to 35 inches. There are two wheels that help move the playard from room to room. The Joovy offers a Two Year Warranty – longer than most other companies. For ease of moving, a travel bag is included. Also included is a 100 percent cotton fitted sheet. Other sheets can be purchased separately. 360 degrees of mesh allows for visibility, breathability, and airflow. Because it is so large and sturdy, more than one child can play in the Joovy at a time. The Joovy sets up and folds easily. This playard is available in two colors. Over 10 square feet of play space! Two children can play in this playard at one time. The Joovy has a two-year warranty. Comes with a fitted sheet. Basic playard – does not come with bassinet or changing center. Expensive for a basic model. Takes up more floor space. 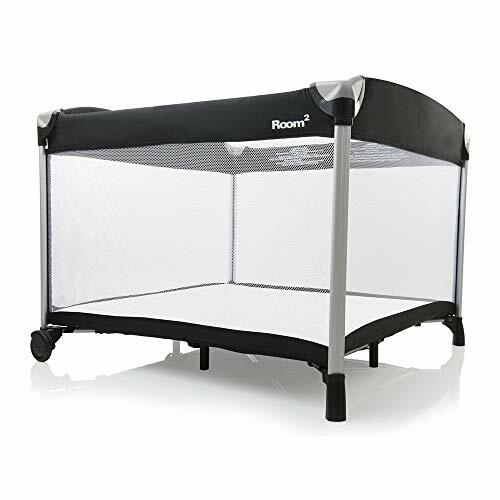 The Joovy New Room2 (Room Squared) Portable Playard is great for a basic playard. It seems to stand up over time and the space that it has is outstanding. The fact that your baby can have a play mate or sibling play with them is an added bonus. Not to mention all of the toys that your child can have in that playard. And Joovy has a two-year customer satisfaction warranty – that’s unheard these days. But, this is just a basic playard and the price is kind of high for that. And being that it is over ten square feet, it does take up more floor space than a traditional playard. 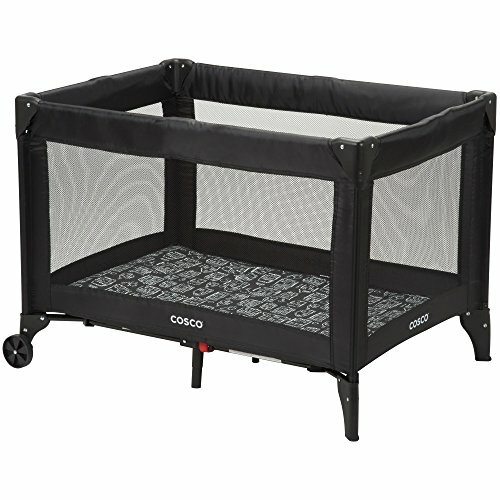 Looking for an inexpensive Pack ‘N Play? Then you may want to consider the Evenflo Portable BabySuite Classic. This playard has a very low price tag attached to it. The Evenflo allows you to set up quickly and take it down just as easily. You can move this playard from room to room easily due to the lightweight design and the fact that the playard has attached locking wheels. When you’re ready to travel, just fold up the unit and pack it up in the carrying bag and go. This playard is appropriate for children up to 35 pounds, less than 35 inches, and from birth to 24 months. The Evenflo has mesh sides for breathability, airflow, and visibility. This model comes in two colors. The playard has locking wheels. This model comes in two colors. The pad is thin and buckles. This is a basic playard – does not come with bassinet or changing center. There is not much to say about the Evenflo Portable BabySuite Classic. It is just your plain basic model that has mesh sides and comes in two colors. It is very inexpensive but it is lightweight and allows you to move it easily from room to room on the locking wheels. However, this model is basic and does not have features you may be looking for such as a changing center or a bassinet and the pad is thin and may buckle. If you are looking for one of the most lightweight Pack ‘N Plays out there with a name that is trusted in quality baby products, then you must take a look at the BabyBjorn Travel Crib Light. This playard only weighs in at thirteen pounds fully assembled. This playard is JPMA Certified. The fabrics of this playard are approved and tested in accordance with class 1 for baby products of Oeko-Tex Standard. This ensures that all fabrics are free from allergenic and harmful substances. It has mesh sides that promote visibility, breathability, and airflow. The mattress is firm for safety but thick and plush for comfort. The mattress is always standing on the floor due to the base plate so there will be no sagging. The crib material is removable so it can be washed for super easy cleanup. This playard is easy to set up and folds down easily and quickly into its included carrying bag. This playard is suitable for newborns to children three years of age. There are seven colors to choose from for your playard. This playard only weighs thirteen pounds when fully assembled. This product is JPMA Certified for safety. The BabyBjorn fabrics have been approved as being Oeko-Tex Standard class 1 safe for babies. The base plate attached to the mattress ensures the mattress is always on the floor for safety. There are seven colors to choose from. The BabyBjorn is more expensive than most Pack ‘N Plays. Narrow opening at the top makes it difficult to place sleeping children in. Shorter parents with short arms may have a hard time reaching all the way down to the floor at the odd angle to place a newborn down. This is a basic playard with no bassinet or changing station. Overall, the BabyBjorn Travel Crib Light is a sturdy and safe basic playard. This playard only weighs thirteen pounds when fully assembled. This product is JPMA Certified for safety. The BabyBjorn fabrics have been approved as being Oeko-Tex Standard class 1 safe for babies. The base plate attached to the mattress ensures the mattress is always on the floor for safety. And there are seven colors to choose from. However, at this price point, you would think that it would come with a bassinet or changing station. Most of the other issues come with the design of the playard. The narrow opening at the top makes it difficult to place sleeping children in. And shorter parents with short arms may have a hard time reaching all the way down to the floor at the odd angle to place a newborn down. All these things need to be taken into consideration before purchasing this playard. When you are looking for a Pack ‘n Play with some extras, take a look at the Graco Pack ‘n Play Playard Snuggle Suite LX. This playard has all the bells and whistles that you have come to look for in a Pack ‘N Play. The Graco has a portable soothing seat that doubles as a bouncing seat that can place and use in the playard as well as use it outside of the Pack ‘N Play. That means you can use this seat anywhere around the house. This seat will hold up to an 18-pound baby safely with its three-point harness. The seat has vibrations in two speeds to help soothe your baby. The seat also features a canopy that can shield the baby from lights. For those times when your baby could use a diaper change, there is a changing station that will work with children until they reach 30 pounds. It has fabrics that wipe clean easily. To make life around the playard easier, there is built in storage for things such as a change of clothes, wipes, diapers, and everything else you can think of. It makes it easy to keep things close to where you need them. The playard has nature and music sound station to help soothe your child and keep them amused. It also has a look light. The infant bassinet runs the length of the playard and is removable once they have outgrown it around 15 pounds. Once they are old enough, the Pack ‘N Play converts into a playard for a toddler to play and nap in until around 35 inches tall. Folding down is simple with the push button fold that makes closing the Pack ‘N Play simple and quick. Bouncer is machine washable. Playard is available in two colors. The Graco has a portable soothing seat that doubles as a bouncing seat. This playard has a changing table with fabric that wipes clean. There is storage attached to the side. The playard has a sound station. The playard is available in two colors. This Pack ‘N Play is pricey. The changing pad won’t lay flat and causes the baby to tilt to the side. The mattress pad is very thin. The colors on websites may not match true to what you receive. Instructions do not come in the boxes, you must look on the internet for instructions on how to put together. 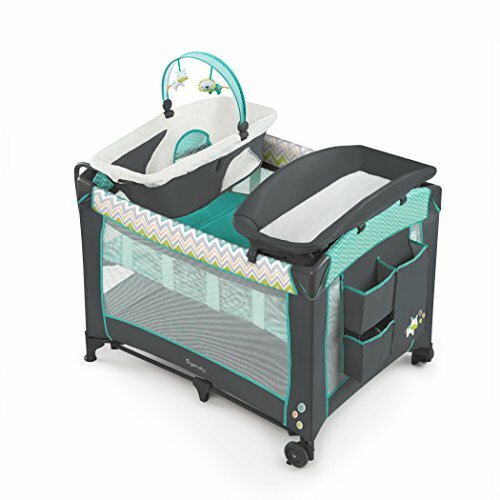 The Graco Pack ‘n Play Playard Snuggle Suite LX does have a few things going for it. The Graco has a portable soothing seat that can also be used as a bouncing seat. This playard has a changing table with fabric that wipes clean. There is permanent storage attached to the side that allows you to have everything you need where you need it. The playard has a sound station that even has a light. The playard is available in two colors. However, the Graco has a laundry list of issues. 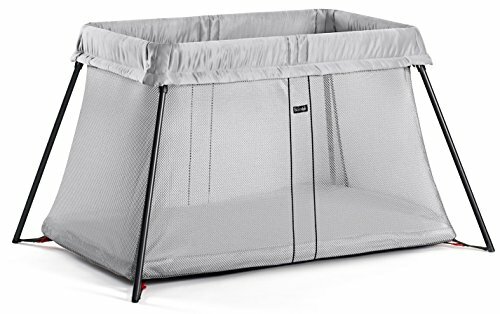 To start with, this Pack ‘N Play is pricey. The changing pad won’t lay flat and causes the baby to tilt to the side. The mattress pad is very thin and can be uncomfortable. The colors on websites may not match true to what you receive. Instructions do not come in the boxes, you must look on the internet for instructions on how to put together. You need to consider all the pros and cons before purchasing this model. If you are looking for plenty of storage in your Pack ‘N Play, then you may want to consider the Baby Trend Deluxe Nursery Center. One thing this playard has is a lot of storage options. The Baby Trend has a full removable bassinet with a canopy. The canopy is also removable once the baby is old enough to come out of the bassinet. The bassinet is good for babies from birth to four months old or fifteen pounds. This playard also has a changing table. The changing table flips out of the way when it is not needed and is removable once the baby outgrows it. The changing table is good for babies from birth to four months old or fifteen pounds. It has a locking mechanism that operates with one hand. The playard is great for children from birth to 30 pounds or 35 inches. There are storage organizers that allow you to keep things such as diapers, wipes, extra clothes, toys, and more within easy reach. To entertain the baby, there is a music center that plays nature sounds and two different styles of music. It even has volume control, vibration, and a night light. The playard is easy to move from room to room with its light-weight design and the large wheels that have locking mechanisms with just one hand. 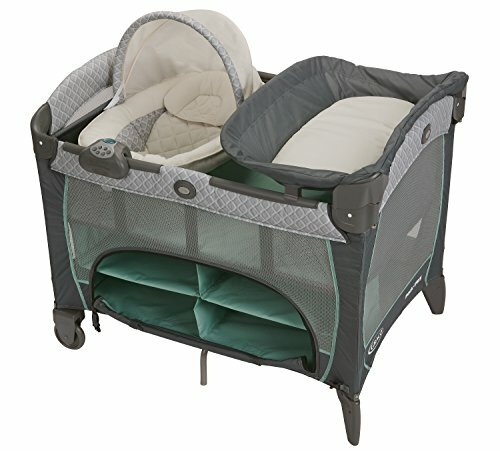 This Pack ‘N Play folds up easily and stores and travels in the included storage case. This playard comes in two colors. The Pack ‘N Play is reasonably priced. The Baby Trend has a full removable bassinet with a canopy. The changing table flips out of the way when it is not needed. There is a music center. The mattress pad is thin and hard. This playard is hard to collapse – fine if you plan on keeping up. The Baby Trend Deluxe Nursery Center has a lot going for it. The Pack ‘N Play is reasonably priced. The Baby Trend has a full removable bassinet with a canopy. The changing table flips out of the way when it is not needed; you can also remove it. There are storage organizers for all the little necessities that a baby needs. There is a music center that has nature sounds and two different styles of music. It even has volume control, vibration, and a night light. However, the mattress pad is thin and hard and the playard is hard to collapse. If you are looking for the playard that seems to have it all, then take a look at the Ingenuity Soothe Me Softly Washable Playard. This playard comes with lots of different systems and areas for your baby. This playard has a DreamCentre for the baby that has soft cloth and mesh sides that allows ventilation and allows the baby to see out the sides. There is a canopy over the top that is removable. It also has a mobile that has a light show and toys to entertain and promote sleep in your baby. The Ingenuity Soothe Me Softly Washable Playard has a lot to offer as a Pack ‘N Play. The fact that it has a DreamCentre, a Diaper Center, storage, a bassinet, and can be washed on top of the basic playard are just bonuses. On top of that, it is easy to set up and easy to store. That makes this playard top of the line. If you have twins, then the Baby Trend Twin Nursery Center may be just what you are looking for. 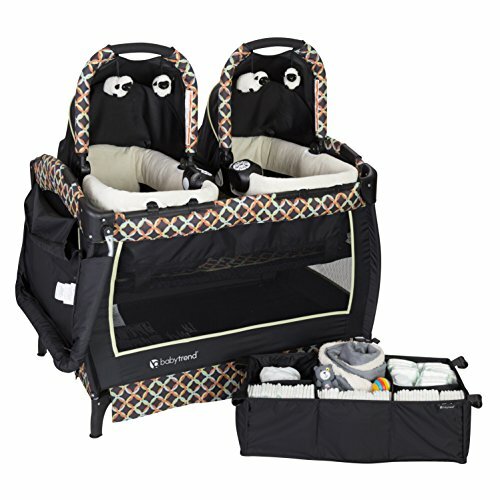 This Pack ‘N Play is geared toward those that have twins instead of having to buy two of everything. The Baby Trend includes two bassinets that are removable. The removable bassinets come with canopies and carrying handles. These bassinets have mesh sides and plush fabric. The bassinets convert into standalone rockers and have hanging toys on the canopies. There are music centers that are electronic on the bassinets that have different modes of sounds, vibration, volume control, and a night light. The changing table flips out of the way when it is not needed. There is also a large organizer to store lots of diapers, wipes, toys, and other necessary baby items. This playard has a locking mechanism that operates with one hand and brakes for the wheels to help move it from room to room. When you remove the removable bassinets, there is a stationary bassinet that runs the length of the playard that can be removed when the babies are old enough for the playard. Suggested times for the bassinets and changing table are up to 15 pounds of 25 inches and the playard is up to 30 pounds or 35 inches. The Baby Trend includes two bassinets that are removable. There are music centers that are electronic on the bassinets that have different modes of sounds, vibration, volume control, and a night light. This playard has a locking mechanism that operates with one hand. The Baby Trend is pricey. Have to remove one bassinet to use changing station. Nowhere to place storage unit unless you use the floor or once again remove one of the bassinets. The Baby Trend Twin Nursery Center has a few good qualities. The Baby Trend includes two bassinets that are removable. There are music centers that are electronic on the bassinets that have different modes of sounds, vibration, volume control, and a night light. The changing table flips out of the way when it is not needed. This playard has a locking mechanism that operates with one hand. There is even storage that comes in handy. However, the Baby Trend is very pricey and everything that you go to do means that you have to remove one of the bassinets such as using the changing station or using the storage unit. That makes this unit not very feasible for twins. If you are a Disney fan and looking for the cute factor, then you may want to consider the Disney Sweet Wonder Play Yard. This playard is for all Disney fans and comes in five color choices for boys and girls. 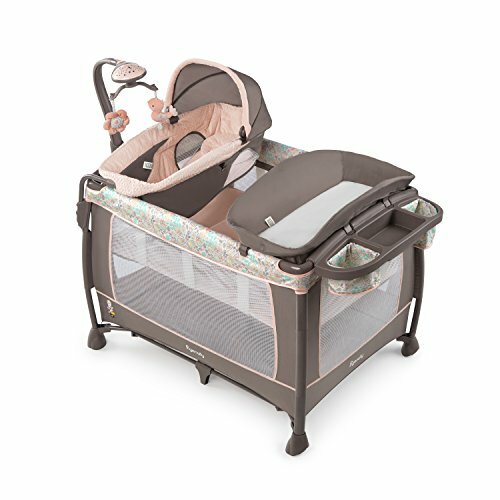 The bassinet runs the entire length of the Pack ‘N Play and gives the baby a clear view of the area through the mesh. There is a toy arch over the bassinet with two toys that is removable. The diaper center is removable and easy to clean. There is a large storage organizer to hold all the necessities such as diapers, wipes, toys, extra clothes, and more. This helps keep everything close at hand. The all mesh construction is great for visibility, breathability, and airflow. Once the baby has outgrown the bassinet, simply remove it and have them enjoy the playard for play and rest. This lightweight playard is easy to move from room to room with its two wheels. When you need to store and travel, just use the included carrying bag. A bassinet with toy arch runs the length of the playard. A changing table is removable and easy to clean. The price of the Disney Sweet Wonder is reasonable. This playard has plenty of storage. The pad is very thin. It is hard to get all the side-bars to lock – this is a huge safety issue. Let’s first go over the good things for the Disney Sweet Wonder Play Yard. A bassinet with toy arch runs the length of the playard. They are both removable when it is time to use the playard. A changing table is removable and easy to clean. The price of the Disney Sweet Wonder is reasonable. This playard has plenty of storage for all of your baby’s necessities. Now, let’s look at the not so good. First of all, the pad is very thin and can be uncomfortable. But the worst of all is the fact that not all of the side-bars will lock in to place. This makes the playard unsafe and unusable. I would think long and hard before purchasing this Pack ‘N Play. Looking for just a basic no thrills Pack ‘N Play? Then take a look at the Cosco Funsport Play Yard. This playard is simple in design without any extras. The Cosco is lightweight in design and easy to move from room to room with the two wheels that make mobility easy. Set up is super easy as it takes less than one minute to set up the playard. Taking down is just as easy and store in the conveniently included storage bag. The mesh is on all four sides and is great for visibility, breathability, and airflow. Your child will also love that they can see what is going on around them. When you’re not sure what style you’re looking for, Cosco has you covered. This playard comes in 16 colors and designs so you are sure to find a design that will fit in with your décor. The Cosco is very affordably priced. The Cosco comes with a great price tag. This playard comes in 16 colors and designs so you are sure to find a design that will fit in with your décor. The mesh is on all four sides and is great for visibility, breathability, and airflow. The Cosco is lightweight in design and easy to move from room to room with the two wheels that make mobility easy. This is a basic model with no whistles – it does not have a bassinet or changing table. The padding on the mat is very thin. This playard is hard to fold back up. The Cosco Funsport Play Yard has its pros and cons. Let’s look at the positives first. The Cosco comes with a great price tag. This playard comes in 16 colors and designs so you are sure to find a design that will fit in with your décor. The mesh is on all four sides and is great for visibility, breathability, and airflow. The Cosco is lightweight in design and easy to move from room to room with the two wheels that make mobility easy. Unfortunately, it comes with some negatives as well. This is a basic model with no whistles – it does not have a bassinet or changing table. The padding on the mat is very thin. This playard is hard to fold back up. I would think long and hard before purchasing this playard. When looking for a Pack ‘N Play, you have to take all things into consideration. Things like storage, bassinets, changing table, price, and portability go a long way when considering a Pack ‘N Play. You may also want to take into consideration mesh sides, entertainment, JPMA Certification, padding, style, clean up ability, and if it has wheels. After taking all of these things into consideration, I have decided that the Pack ‘N Play of my choice if the Ingenuity Smart and Simple Playard. This playard comes with lots of different systems and areas for your baby. The sides of the playard is entirely mesh for visibility, airflow, and breathability. Making such an important choice as for where your child will play for up to three years should not be taken lightly. In addition, some of these models are not cheap. Be sure to make an informed decision and your child will sure to love what you pick out for them.